Burglars will always exploit inherent weakness with euro cylinders, these are most commonly found on uPVC doors. The euro cylinder is very weak by design at the centre point. This is the point where both the cam and the screw fixing hole meet, there is very little metal at this point to give the lock barrel strength. A burglar will use simple tools to break the handle backplate to expose the end of the cylinder barrel. Using household tools such as mole grips, the cylinder can be clamped, twisted and then broken in one swift simple action. The burglar inserts a tool into the door and turns the locking points to open the door. It is simple and fast and is a common attack method that gains entry to your property. Some cylinders have snap lines towards the end of the cylinder and these are not that effective. The PVC frame can be opened up to allow tools to clamp the remaining lock, leaving it vulnerable to attack and allowing the burglar to gain entry. 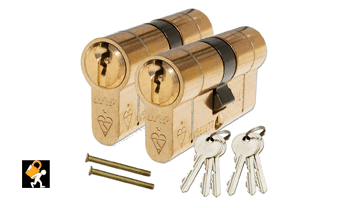 Locks that are TS007 3 Star standard also known as ‘anti-snap’ cylinders, are locks that meet the requirements to withstand lock snapping attempts. Anti-Snap cylinders have a ‘snap-off’ section integrated which will come away if a burglar was to try and snap the lock. This makes the cylinder shorter, making it more difficult to grasp. With the help of built in grip defenders it makes getting hold of the cylinder even harder. Not only that but anti-snap locks have a hardened bar which will not snap, it will only flex making snapping almost impossible. Check that your current locks do not over extend, if they appear vulnerable you may want to consider having them replaced. If you need any help with identifying your euro cylinder or require assistance removing your door cylinder. Call Lee from Lockman Birmingham today on 0121 4011 404 we provide locksmith services across Birmingham and can be with you in 20 – 60 minutes day or night.